retired high school principal, Hanging at the beach in Cape May. Kristofer, More…30, film producer for Eskimo Productions in LA. Served in the US Coast Guard. Played basketball in the Coast Guard and one year at Temple. Attended Temple, Penn State and Cheyney U. Taught in Philly for 34 years. 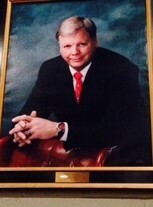 Retired as Principal of Northeast HS. Worked for ten years as a Principal Mentor in New Orleans, Newark, Rochester and Chicago after retirement. Married for 41 years. Kelly Barton has a birthday today. Kelly Barton added a comment on his Profile. Kelly Barton has a birthday today. New comment added. Kelly Barton updated his profile. View. Kelly Barton posted a message. New comment added. Glad to see you on Facebook. Missed you at the reunion. Was were all asking about you. We'll have to catch up. Regards. Kelly Barton has left an In Memory comment for Robert Sanders. Bobby Sanders was a great guy. He lived on Lawrence St. Near Tabor Rd. He went To Morrison Elementary, along with Gaynel, Billy Summers, Kathy Doran, Linda McCoombe, Linda Stevens, Drew Barth and many other classmates from Olney. He used to wear a black hat at Olney. We used to call him "the hat". It's sad seeing his name and others from our class who are gone..
Kelly Barton has left an In Memory comment for John E. Bussell. I played basketball with John. He was 6ft. 10in. tall. A real big guy. Everyone would remember him walking through the halls at Olney? He went on to play in a band, Sweet Stavin Chain. You would probably remember a hit song they had, Teddy Bear's Picnic. It was played on the radio all of the time. It's still on Youtube. John had a great sense of humor. I remember riding in his car once. He was so big that he had to move his seat way back so he could get in. It reminded me of Wilt Chamberlain's car. The front seat was actually where the back seat would be. Interesting how these things stick in your head. Thought I would share them so classmates would get a feel for who John was. Kelly Barton posted a message. Fred (Rick? ), I don't remember Rick. Just saw your profile. I'm not a Facebook guy, but had to sign up when I saw you there. It's been many years. Hope you are well and planning to attend the reunion on 10/22. Look forward to hearing from you. Regards. Kelly Barton changed his profile picture. Thanks for adding me to the class reunion page..